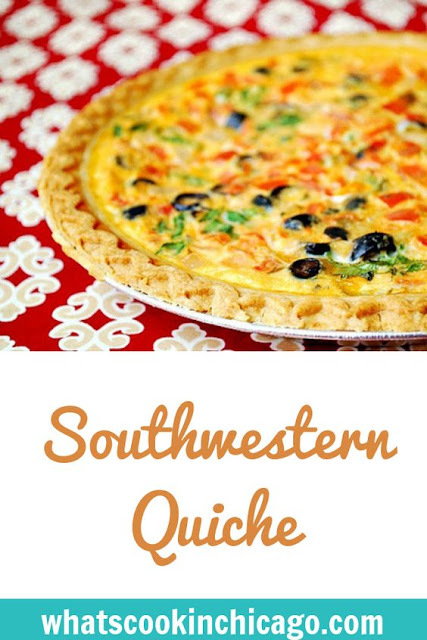 I really enjoyed this quiche because it was chockful of so many southwestern flavors I enjoy. The chorizo gave it an extra kick along with the salsa. In the recipe I didn't specify what salsa to use simply because you can use whatever kind you prefer - red, green, etc. You could also add additional ingredients like sauteed onions, peppers, chilis so this is a very versatile recipe that can be adapted to your tastes. 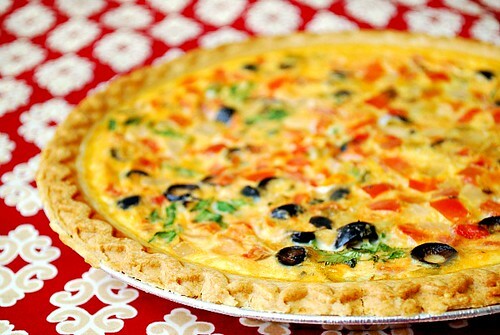 This quiche also freezes well. Simply bake as directed, cool, slice and then freeze the entire pie pan in a gallon sized freezer bag to enjoy later. When you want a slice, just pop out a slice and heat it up in the oven or microwave for a few minutes. Prepare a pie plate with the pie crust. Place the chorizo into the prepared pie plate. Sprinkle 1/2 cup cheese over the chorizo. Season with salt and pepper. In a medium bowl, whisk together salsa, eggs and milk. Season with salt and pepper. Pour into the pie crust over the chorizo. Bake in preheated oven for 30 minutes. Sprinkle top with the olives and bake an additional 15 minutes, until set in center. Allow to stand 10 minutes and garnish with chopped fresh cilantro before serving. Yum!! This looks and sounds great! I'm not a huge fan of leftovers but I definitely would enjoy this whole quiche. I assume this is made with Mexican chorizo (the kind that crumbles up), instead of Spanish chorizo? Did you drain off all of the grease before adding? And did it generate much grease (again) when you baked it?